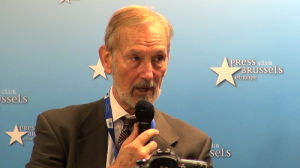 The following video recording posted on youtube presents excerpts (50 minutes) of a discussion in the European Parliament building on December 2, 2014 co-organized by the GUE/NGL group of parties and the Committee on East-West Accord, European Office. For those unfamiliar with acronyms of the political blocs in the European Parliament, GUE/NGL translates roughly into Progressive Left, with major constituent elements from Germany’s Die Linke and the Nordic Greens. Die Linke have recently appeared in the news monitored by students of Russian affairs thanks to the forceful statement by their deputy party leader last week in the Bundestag denouncing Chancellor Merkel’s policies of sanctions against Russia for subservience to U.S. rather than German interests. MEP Gabriele Zimmer, who makes the keynote speech in this video, is respectively Die Linke’s lead representative in the European Parliament, where she chairs the GUE/NGL bloc of parties. In addition to Gabriele Zimmer, other featured speakers on this video are MEP Miloslav Ransdorf, Czech Republic, and Gilbert Doctorow. Ransdorf is deputy chair of the Parliament’s committee on energy and is a frequent visitor to Ukraine. He was one of 15 MEPs in a delegation that monitored the 26 October elections in Ukraine, where he was an observer in the Dnepropetrovsk region. The video presentation has been excerpted from full proceedings lasting one hour twenty-three minutes. For purposes of accessibility to the widest possible audience it offers the speeches of the three pre-announced panelists delivered in English. This educational non-governmental organization is dedicated to arranging public debates and panel discussions of crucial issues of international security. We do this to address the near total absence of public discourse on these sensitive matters in the current moment of information warfare between Russia and the West. The silence of civil society is resulting in formulation of foreign policy based on very partial information. It calls into question the pluralism which underpins our democracy. And it is leading us into a New Cold War with incalculable risk of escalation into a nuclear exchange.